1. i'm still, being relatively new to everything i'm discussing on this site (ha! ), enjoying simple focused concentration meditations. 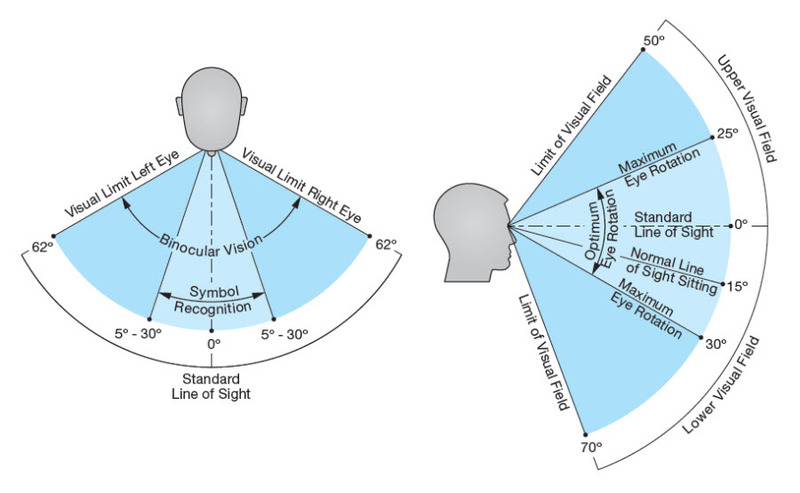 i feel this is vital tool for any prayer/working in attempt to see/experience and get noticeably (or obvious rather) actual/real/sensed/ (AS WELL AS new/unusual at times, and not always in the form expected. double ha!) results manifest in the physical. we can focus on any one/single thing. a dot. a #. a letter. the breath. an orange. one thing that is some thing you like perhaps might even be best, but know that's just a random thought i threw in just now, so maybe just the breath for example is best. your choice, as everything is! so now i'm thinking perhaps it's 20° UP (perhaps hence why in Buddhist traditions, it is taught to have the head tilted slightly downward as to natural have the eyes view up a tad? thoughts? please comment! i like it when i can learn from you!!! when i find myself wrong due to the thoughts of another, i find myself as having learned something, which is awesome!) also, i'm considering this image as a rough guide only, and perhaps the ranges can be expanded with practice, idk. disclaimer: please don't go straining yourself, especially your eyes, ever... unless its your will to do so. know that i'm not recommending nor condoning (though have myself done and found useful) things like sun-gazing (also moon & other orb gazing/skrying? ), certain chemicals & practice for enhanced vision nor attempting to widen your personal visual range in any way... always see your doctor and do your research before trying anything you've never done i say!!! more meditations to be added, but this one could be (after only a tiny level even of concentration is obtained) used in conjunction with some of my favorite types of pranayama (like the first one listed). This entry was posted in meditation and tagged asana, correspondence, mentalism, scrying, visioning by Z30 AJF. Bookmark the permalink.